A calcaneus fracture is a fracture of the heel bone. Most commonly, the heel bone gets squashed flat and then widens. The joint between the calcaneus and the talus is called the subtalar joint. 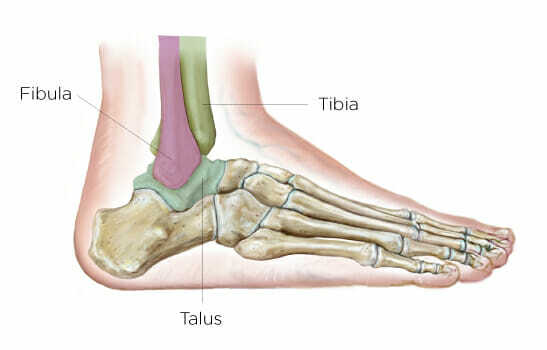 The subtalar joint is usually damaged during the trauma, and inward and outward movements of the foot are compromised. The goal of treatment is to restore the anatomic dimensions of the heel as accurately as possible. This is achieved by inserting plates and screws into the bone. This improves the shape of the heel, decreases the likelihood of arthritis developing, and maximizes the potential for inward and outward movement of the foot. Weight-Bearing: You will not put weight on the affected foot for six to eight weeks after surgery (non-weight-bearing). Physical Therapy: You will start physical therapy six to eight weeks after surgery. Eight days: The bulky Jones splint is removed, stitches are removed, and X-rays are completed. You will be placed into a CAM boot. A CAM boot supports the foot and ankle and provides protection after surgery. Six Weeks: X-rays are completed and the healing is evaluated to determine how much weight you can place on your foot. If everything looks good, a progressive weight-bearing program is started. The ankle consists of the inner aspect of the tibia (the medial malleolus), the outer aspect of the ankle (the fibula), and the bone underneath the ankle (the talus). There are many different varieties and grades of severity of ankle fractures. If the shape and anatomy of the ankle is not accurately restored, the cartilage of the ankle is disturbed, which will inevitably lead to arthritis. The goal of treating all ankle fractures is to surgically reposition the bones and hold them with plates and screws to decrease the occurrence of arthritis. Weight-Bearing: You will not put weight on the affected foot for two to eight weeks after surgery (non-weight-bearing). Immobilization: You will be immobilized in either a splint or CAM boot to compress, limit movement, and protect the area after surgery. A CAM boot supports the foot and ankle and provides protection after surgery. Two Weeks: The dressing and stitches are removed, and X-rays are completed. You will be placed into either a cast or a CAM boot. Six Weeks: X-rays are completed and the healing is evaluated to determine how much weight you can place on your foot. If everything looks good, a progressive weight-bearing program is started, which includes transitioning into a normal shoe. The Lisfranc joint complex includes the bones and ligaments that connect the midfoot and forefoot. Lisfranc injuries include ligament strains and tears, as well as fractures and dislocations of bone. Injury in this area without surgical fixation can cause devastating results. The goal of surgery is to realign the bones and hold them with screws and plates to prevent early arthritis. Two Weeks: You will be placed into a bulky Jones splint, a CAM boot, or a soft splint bandage to compress, limit movement, and protect the area after surgery. The Achilles tendon is a large tendon along the back of your ankle and is vital for a normal walking gait. When a large stress is placed on the tendon, it can rupture, causing a loud “pop” and extreme pain. What is an Achilles tendon repair surgery? The goal of surgery is to regain the function and strength of the Achilles tendon. The strength of the muscle depends on establishing the exact correct tension between the muscle and the tendon. Weight-Bearing: You will not put weight on the affected foot for two weeks after surgery (non-weight-bearing). Physical Therapy: You will start physical therapy program six weeks after surgery. Two Weeks: The bulky Jones splint is removed; stitches are removed. You will be placed into a CAM boot. A CAM boot supports the foot and ankle and provides protection after surgery. Six Weeks: You will start a physical therapy program. Three Months: Strength is evaluated.